You can make your gardening life a lot easier by simply choosing the right plant for each spot in your garden. You can make your gardening life a lot easier by simply choosing the right plant for each spot in your garden. Gardening can seem difficult, plants get too much sun or too little. They get too much water or too little. They get besieged by bugs or disease. A plant can sometimes be too big or too small for the spot it is occupying. Plants succumb to dogs and kids running wild. In short, a lot of things can happen to challenge your plants. You can make your gardening life a lot easier by choosing the right plant for each spot in your garden. The whole concept behind right plant, right place is that if you choose plants that are well-suited to the location where they are planted they will perform well with limited additional input. Plants that are well suited to their site will establish quickly, they will have a healthy root system, and be healthier plants. Healthy plants will be much better equipped to withstand problems than those who are struggling with an environment. Healthy plants growing in ideal conditions will be less likely to become diseased. The same way we are less likely to catch a cold if we are well-rested and healthy. Healthy plants are also less likely to be adversely affected by insect damage. If a few insects munch on healthy plants, the plants are likely to shrug off the damage and keep on growing and flowering. If unhealthy plants are munched on by insects, the plants have less energy to deal with the invading pest and will be more adversely affected. So how do you make right plant, right place work for you? It is really very simple. First you want to evaluate your local conditions, not just for your garden, but the general environment. Do you have long, hot, humid summers? Are they hot, but dry? Is it milder with cool nights, even when the days are hot? Do your conditions tend to be wet, dry or somewhere in between? Also think about what plants grow in your area naturally. While I think it is good to consider native plants, you don't need to limit yourself to them. Once you have considered the overall environment in which you live, it is time to consider the actual spot where you garden. Each and every garden will consist of many different microclimates. A microclimate is an area within your garden that is different from the general conditions. Do you have a slope and the top of the slope tends to by drier than anywhere else? Do you have a bed along your home that stays warmer than surrounding areas? Do you live near the ocean and have certain areas that are sometimes sprayed with salt water? Do you have a spot that tends to stay wet or cooler than anywhere else? Do you have an area that is sheltered from the wind? There are a myriad of ways you can have microclimates. Paying attention and learning what your microclimates are will help you identify the plants that will do best for each spot in your home garden. It can also help you identify a spot where a plant that you didn't think you could grow will thrive. It is often possible, using a microclimate, to nurse a plant that shouldn't be winter hardy into being a perennial for you. How much sun does the location receive? 6 or more hours of sun is considered full sun. 4 to 6 hours of sun is considered partial sun/partial shade. Less than 4 hours of sun is considered shade. Using plants that are suited to the amount of sun they will get is the first step in keeping your plants happy. Does the soil tend to be wet, dry, or normal? 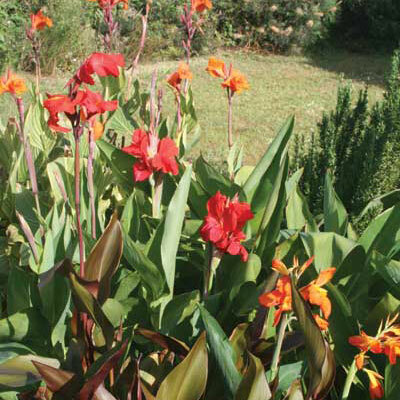 If you have a wet area, there are many plants that thrive in moist conditions. Just don't try to plant something that likes good drainage. If you have a spot that tends to be dry don't plant something that prefers moisture. This isn't to say you should only use drought tolerant plants, but putting a water lover in an especially dry spot just makes things harder. Remember also that nearby trees and shrubs often have extensive root systems which will leave less water for annuals and perennials located nearby - so choose accordingly. Is the bed close to a water source? Plants that need water shouldn't be in the far corner of the garden - keeping them watered will be that much harder. There are plants that are low-water usage (we often call them "end of the hose" plants) that won't need much additional water to be perfectly happy, they are good ones to have beyond the reach of the hose. Is the bed in a high traffic area or out of the way? Is it right by the sidewalk so you will think of deadheading the plants or is it in the far corner where you might ignore it for weeks at a time? If you place high maintenance plants in a location you see more often, you will be more likely to keep up with routine maintenance like pruning, deadheading, fertilizing or treatment for pests and disease. Let the plants that can take abuse be in the far corners of the garden. What structures are near the bed that might affect it? A bed against a brick wall that is blasted by the sun all day will be hotter than a similar full sun bed that isn't against a wall. A bed surrounded by concrete will tend to be very hot also. A wall can also serve as a wind break and in a windy area can be a prime location for delicate plants. Are there any other factors to consider? For instance -- is the bed close to the ocean where it will receive salt water spray? Choose plants that can withstand salt. Is the bed near the kids favorite play area? Choose tough as nails plants that can withstand abuse. Is the bed under a window? Is the space narrow? Choose plants that don't naturally spread a lot. Once you have spent some time thinking about the nature of each bed, what special quirks it may have, it is time to choose plants to go in those beds. What are the sun/shade requirements of the plant? This is the most basic thing you can do to help your plants thrive. Choose plants that like full sun for sunny locations and choose plants that like shade for shady locations. All plant tags should include this information. What are the water requirements of the plant? If it says drought tolerant or low-water usage it is a great plant for a dry spot or a "beyond the end of the hose" plant. If the plant likes moist soil, slot it for that damp spot you have. The plant tag will contain information on general water requirements, but it may pay off to search out some information before heading to the garden center. What is the habit of the plant and how large will it get? Is it upright, mounded, spreading, trailing? Is it tall and narrow or low and wide or maybe tall and wide? Choosing a plant that will fit the spot it goes into makes maintenance a lot easier. This is especially true when choosing perennials, trees and shrubs. It can be hard to look at that small plant and realize that in a few years it can be quite large. When choosing woody materials, be sure to pay attention to final size, we have all seen shrubs that are taller than the windows they are planted under or that are trying to take over a sidewalk. Yes, you can prune them to keep them in line, but why make it hard for yourself when you could choose a plant suited to the size of your spot. Size does matter. Size and sometimes habit will be on the plant tag. Look at the maintenance requirements of the plant. There is nothing wrong with choosing plants that are high maintenance but consider how much time you have, and want, to devote to your garden and choose plants accordingly. Place the high maintenance plants in locations that you will see often, it will help you remember to keep up with routine maintenance. If you don't have much time, there are many low maintenance plants available. One of the things Aussie Winners® selects for is plants that don't need deadheading to bloom consistently. So some plants that traditionally needed deadheading may no longer need it. For instance, our Happitunia® Petunias do not need deadheading to bloom all summer. This information may be on the tag, but it may not be. With limited space on the tag, there is only so much information we can include. Our website is a great resource for additional information on our plants. If you are looking for specialty plants, something super tough, salt tolerant, perhaps drought tolerant, critter tolerant... you may want to research your options before heading to the garden center. For those plants that are more delicate, go ahead and buy them just be careful that you place them in an area that is well-suited for them. Just because a plant can be fussy that doesn't mean you won't be successful. Right place, right plant might seem difficult, but really it is simply a matter of choosing a plant that is well-suited to the location it will be grown in. Putting some time in before planting can seriously decrease the amount of time you have to spend after planting and can help your garden shine. Remember, if a perennial or shrub doesn't thrive where you have planted it -- try and evaluate why it is unhappy and then move it to a better location. Spring and autumn are the best times to transplant perennials and shrubs. It is not uncommon for even experienced gardeners to try plants in several locations before finding the perfect spot. A less than perfect result should never be viewed as a failure, embrace it as a learning experience. Gardening is one of those things you can only really learn by doing. Any time you learn by doing, you are going to end up with learning experiences. And remember there's always next year!